1). To guarantee the leakproofness of furnace wall and reduce the air leak of combustion chamber. 2). To achieve the full water cooling of combustion chamber, and the boiler accessories membrane water wall is benefit to prevent coking under the condition of supplemental firing. 3). The thermal storage capacity is small, the warming of combustion chamber is fast and the cooling is also fast, which could shorten the cooling time of boiler’s start and furnace shut down. 4). 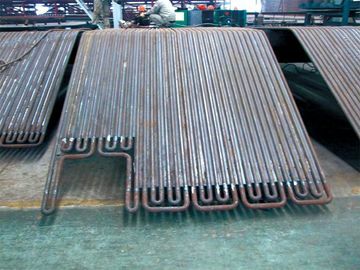 It is good to adopt top supported water cooled wall and it could reduce the load of boiler framework, which is benefit to overhang. 5) Compared with the bare tubes, the membrane water wall improves the heat absorption capacity of tubes. 6) The factory direct boiler membrane water wall could improve the Preliminary combination degree of boiler parts and reduce the installation workload. Boiler water walls are membrane walls that are made of tubes welded together with or without a strip of metal in between. These walls form the enclosure of the coal combustion chamber. Water wall tubes are also referred to as the evaporator section; they contain water mostly in liquid form which gradually evaporates as it rises in the boiler. As the water wall tubes form a lining along the whole boiler, they are submitted to a temperature gradient of 300 °C to 500 °C between the bottom section of the boiler and its top. To facilitate fitting, the panels in the boiler should preferably be made of steel grades that do not require any post-weld heat treatment. Vallourec supplies tubes for water walls in all grades, from carbon steel to advanced low-alloy steel, with outside diameters ranging from 31.8 mm to 63.5 mm. BS 3059 Grade 440 seamless carbon steel tubes. STT II – Surface Tension Transfer (STT) Process with certified & tested weld procedures. 1.The function of the superheater in the thermal power plant is to remove the last traces of moisture ( 1 to 2%) from the saturated steam coming out of boiler and to increase its temperature sufficiently above saturation temperature. 2.The super-heating heating raises overall overall cycle efficiency efficiency as well as avoids too much condensation in the last stages of the turbine which avoids the blade erosion. 3.The heat of combustion gases from furnace is utilized for the removal of moisture from steam and to superheat the steam. 4.Super-heaters usually have several tube circuits in parallel with one or more return bends, connected between headers. Welding Extruded longitudinally finned tubes.